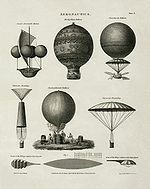 Picture - 1818 technical illustration shows early balloon designs. British Rear Admiral Charles Henry Knowles proposes to the Admiralty that the Royal Navy loft an observation balloon from a ship in order to reconnoitre French preparations in Brest to invade Great Britain. His proposal is ignored. 18 July - Etienne Gaspar Robertson and Lhoest climb from Hamburg (Germany) up to 7,280 m in a balloon. 3-4 October - Frenchman Andr�-Jaques Garnerin covered a distance of 395 km from Paris to Clausen with his Montgolfix�re. Count Francesco Zambeccari publishes a five-volume work on ballooning and aeronatics. Sir George Cayley builds a model glider with moveable control surfaces. August/September - experiments by physicists Joseph Louis Gay-Lussac and Jean Baptiste Biot disproved the theory that the Earth's pull decreases with height. 7 September 7 - Zambeccari and two companions, Grasetti and Andreoli, ascend in Bologna attempting to cross the Adriatic, but have to be rescued after one day at sea. J. Kaiserer suggests making a Montgolfix�re manoeuvrable with the help of tame eagles. Lord Thomas Cochrane flies kites from the Royal Navy 32-gun frigate HMS Pallas to spread propaganda leaflets along the coast of France. It is the first use of an aerial device in European maritime warfare. 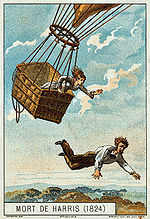 Picture - Gay-Lussac and Biot ascend to 4,000 m in a hot air balloon, 1804. Illustration from the late 19th Century. Jakob Degen, a watchmaker from Vienna, experiments with an apparatus with valve-flap, flapping wings. Degen tries to combine a Montgolfix�re with the flapping wings. Degen propels a hydrogen-filled balloon by flapping large ornithopter-style wings. September - Sir George Cayley published his seminal paper On Aerial Navigation, setting out for the first time the scientific principles of heavier-than-air flight. Picture - Zambeccari and two companions after their failed attempt to cross the Adriatic, 1804. Illustration from the late 19th Century. 31 May - Albrecht Ludwig Berblinger, the "tailor of Ulm" (Germany) crashes in his apparatus, a copy of Degen's, into the Danube. It was presumably a workable hang glider. 19 July - lamp gas used to fill a Montgolfix�re (Green). Picture - Harris jumps from his balloon to save his fianc�e. Illustration from the late 19th Century. Englishman Thomas Harris jumps to his death from a balloon in order to save his fianc�e's life when relieving all ballast cannot stop the precipitous plunge after an accidental drop in pressure. Jan Wnęk reportedly performs several public gliding flights from the Odporyszow village church tower. (Austria/Hungary border). 7-8November - flight of a coal gas balloon by Charles Green covering 722 km from London to Weilburg, with passengers Holland and Mason. Robert Cocking jumps from a balloon piloted by Charles Green at a height of 2,000 m (6,600 ft) to demonstrate a parachute of his own design, and is killed in the attempt. The American John Wise introduces the ripping panel which is still used today. The panel solved the problem of the Montgolfiere dragging along the ground at landing and needing to be stopped with the help of anchors. Charles Green and the astronomer Spencer Rush climb up to 7,900 m in a free balloon. Picture - Arban is rescued by Italian fishermen, 1846. Illustration from the late 19th Century. Louis Anslem Lauriat makes the first manned flight in Canada, at Saint John, New Brunswick, in his balloon Star of the East. 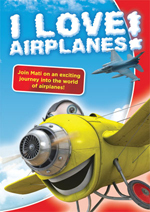 November - English engineer William Samuel Henson makes the first complete draft of a power driven aeroplane with steam engine drive. The patent follows the works of Cayley. The English House of Commons rejects the motion for the formation of an "Aerial Transport Company" with great laughter. 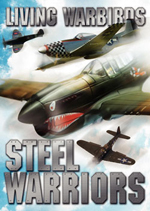 William Samuel Henson and John Stringfellow build a steam powered model aircraft, with a wingspan of 10 ft (3.5 m) which successfully flies a distance of 40 m before crashing into a wall. This was the world's first heavier-than-air powered flight. 12-25 July - While blockading Venice, the Austrian Navy launches unmanned balloons (Montgolfix�res) equipped with explosive charges from the deck of the steamship Vulcano in an attempt to bombard Venice. Although the experiment is unsuccessful, it is both the first use of balloons for bombardment and the first time a warship makes offensive use of an aerial device. Sir George Cayley launches a 10-year old boy in a small glider being towed by a team of people running down a hill. This is the first known flight by a person in a heavier-than-air machine. 7 October - Frenchman Francisque Arban flies over the Alps in a free balloon (Marseille-Subini near by Turin). 24 September - French engineer Henri Giffard flies 27 km (17 miles) in a steam-powered dirigible, reaching a speed of about 10 km/h. Formation of the first society for promoting aerial navigation (Soci�t� A�rostatique et M�t�orologique de France). Late June or early July - Sir George Cayley's coachman successfully flies a glider, designed by his employer, some proportion of the distance across Brompton Dale in Yorkshire, becoming the world's first adult aeroplane pilot. Unimpressed with this honour, the coachman promptly resigns his employment. Joseph Pline is the first person to use the word "aeroplane" in a paper proposing a gas filled dirigible glider with propellers. December - French Captain Jean Marie Le Bris flies 600 ft in his Artificial Albatross glider. F�lix Du Temple flies clockwork and steam-powered model aircraft, the first sustained powered flights by heavier-than-air machines. French brothers du Temple de la Croix apply after successful attempts with models for a patent for a power-driven aeroplane. French airman Nadar takes the first aerial photographs. 1-2 July - John Wise and three companions complete a Montgolfix�re flight over a distance of 1,292 km (St. Louis - Henderson, USA). The first use of observation balloons in naval warfare takes place during the American Civil War (1861-1865). First telegraph message is sent from the air, by Thaddeus Lowe in the balloon Enterprise. The Union Army Balloon Corps is formed under Lowe's command, for observation and artillery direction. Balloons would see major use in the U.S. Civil War over the next four years. 3 August - The United States Army steamship Fanny becomes the first ship to loft a captive manned balloon when a civilian aeronaut, John La Mountain, ascends from her deck to observe Confederate military positions at Hampton Roads, Virginia. He ascends again a few days later either from Fanny or a ship named Adriatic. The United States Navy barge George Washington Parke Custis becomes the first ship configured to conduct air operations, transporting and towing observation balloons along the Potomac River. She continues these operations into early 1862. Late March - Civilian aeronaut John H. Steiner takes United States Navy officers aloft in an observation balloon from the deck of a flatboat on the Mississippi River so that they can direct the fire of U.S. Navy mortar boats against the Confederate-held Island Number Ten It will be the last aerial guidance of naval gunfire anywhere in the world until 1904. March-May - The United States Navy barge George Washington Parke Custis transports and tows observation balloons along the York River in Virginia during the Peninsula Campaign. April - John B. Starkweather ascends several times in a balloon from the deck of the Union paddle steamer May Flower to observe Confederate positions at Port Royal, South Carolina. June - The Confederate States Navy chooses the steamer CSS Teaser to embark a balloon for use in observation of Union Army positions along the James River in Virginia. 1-3 July - The Confederate States Navy steamer Teaser operates a coal-gas silk observation balloon to reconnoitre Union Army positions along the James River in Virginia, the only use of a balloon by the Confederate States Navy. Her capture on July 4 by the steamer USS Maratanza ends Confederate naval balloon operations. 5 September - After a dramatic take-off, aeronaut Coxwell and English physicist Glaisher reach 9,000 m (29,527 ft). The Union Army Balloon Corps is disbanded early in the year. 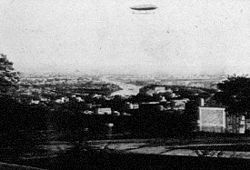 Dirigible airship flown by Solomon Andrews over Perth Amboy, New Jersey. 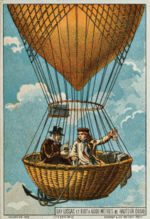 Civilian aeronaut John H. Steiner takes Ferdinand von Zeppelin, a Prussian Army officer assigned to the Union Army as an observer, aloft in a balloon. Zeppelin later will credit this ascent as his inspiration to create the rigid airship, which he first flies in 1900. Outbreak of the War of the Triple Alliance between the Alliance of Argentina, Brazil and Uruguay against Paraguay. The Alliance forces made much use of balloon reconnaissance over the next six years. Dirigible airship flown twice over New York City by Solomon Andrews. 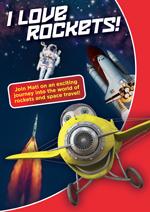 Jules Verne describes in his novel The Journey to the Moon the launch of a rocket from Florida, from where many years later U. S. space flights actually start. The Frenchman d'Esterno writes in his book About the flight of birds, "Gliding seems to be characteristic for heavy birds; there are no odds which are stacked against that humans can not do the same at fair wind." French artist and farmer Louis Pierre Mouillard makes a successful gliding flight. After years of studies about bird flight he publishes his book L'Empire de l'Air in 1881. He thinks that imitation of gliding and soaring flight of birds is possible, but not the imitation of the flapping of wings. First South American military balloon reconnaissance ascent. The 6th of July, Lieutenant Colonel Roberto A. Chodasiewicz, an Argentine Army military engineer, makes the first South American military observation ascent, manning a Brazilian Army's captive ballon over Paraguayan troops, during the Triple Alliance War. Foundation of the Royal Aeronautical Society, the world's oldest society devoted to all aspects of aeronautics and astronautics. Jan Wnęk makes gliding flights (1866-1869) from the Odporyszx�w church tower. Church records only. Henry Giffard installs a huge captive balloon for 20 passengers at the World Exposition in Paris. M.Boulton applies for an English patent for the use of a wing flap. First exhibition of aviation in London's Crystal Palace. Balloons are used by the French to transport letters and passengers out of besieged Paris during the Franco-Prussian War. Between September and the following January, 66 flights carried 110 passengers and up to three million letters out of Paris. The Englishmen Wenham and Browning do air flow experiments in a wind tunnel. 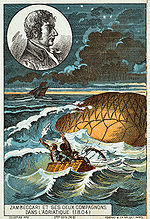 2 February - French navy-engineer Dupuy de Lome achieves 9 to 11 km/h with his muscle powered airship. 13 December - Paul Haenlein tests the first airship with a gas engine in Brno, achieving 19 km/h. The tests were stopped because of a shortage of money. German engineer Paul Haenlein flies a dirigible with an internal combustion engine on a tether in Vienna, the first use of such an engine to power an aircraft. 5 July - Belgian Vincent de Groof is killed in an accident as he tries to do a flight using flapping wings. 20 September - Felix and Louis du Temple de la Croix build a steam-powered monoplane which achieves a short hop after gaining speed by rolling down a ramp. It carries a human operator whose identity is no longer known. Englishman Thomas Moy tests a tethered power driven aeroplane with steam engine drive and a wing span of 4 m.
15 April - the scientific flight of the montgolfiere "Zenith" up to 8,000 m ends in the death of two aeronauts and the deafness of Gaston Tissandier. Frenchmen Penaud and Gauchot apply for a patent for a power-driven aeroplane with a device for drawing in the undercarriage, and wings with upward dihedral and a stick control. First flight of a steam-driven model helicopter built by Enrico Forlanini. Charles F. Ritchel publicly demonstrates of his hand-powered, one-man rigid airship, and eventually sells five of them. The British Army gains its first balloon, the Pioneer. Frenchman Victor Tatin builds a power-driven model aeroplane with airscrews and a compressed air motor, successfully flying of the ground. Alexander Fjodorowitsch Mozhaiski patents a steam-powered aircraft. Karl Wx�lfert and Ernst Baumgarten attempt to fly a powered dirigible in free flight, but crash. Balloons are used in British military manoeuvres for the first time at Aldershot. 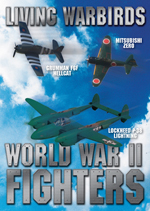 The Berlin-based "German Society for Promoting Aviation" publishes a magazine, the "Zeitschrift fx�r Luftschiffahrt" (Magazine of Aviation). The first electric-powered flight is made by Gaston Tissandier who fits a Siemens AG electric motor to a dirigible. Airships with electric engines (Tissandier brothers, Renard and Krebs). American AJ King invents the fast moving internal combustion engine, which is suitable for aviation because of its good power to weight ratio. John J. Montgomery makes a controlled heavier-than-air flight. His first two gliders did not include flight controls but his third featured aileron prototypes. Picture - The astronomer Jules Janssen took this photo of the French officers' Charles Renard and Arthur Krebs La France dirigible from his Meudon (France) astrophysic observatory in 1885. 9 August - The first fully controllable free-flight is made in a French Army dirigible by Charles Renard and Arthur Krebs. The flight covers 8 km (5 miles) in 23 minutes. It was the with landing on the starting point. Mozhaiski finishes his monoplane (span 14 m, or 46 ft). It makes a short hop after running down a launch ramp. British Army balloons are taken on the expedition to Bechuanaland in South Africa. The Imperial Russian Army adopts the balloon for military service. Englishman Horatio F.Philipps has a patent issued for caved profiles of wings. The Prussian Airship Arm (Preussische Luftschiffer Abteilung) becomes a permanent unit of the army. British Army balloons are taken to Sudan by the expeditionary force headed there. 12-13 September - Frenchmen Herv� and Alluard achieve a Montgolfiere flight over 24 hours. Wx�lfert flies a petrol powered dirigible at Seelburg. The engine was built by Gottlieb Daimler. Percy Pilcher builds a human-carrying glider, the Hawk, and begins development of a light internal combustion engine. Otto Lilienthal publishes in his book Der Vogelflug als Grundlage der Fliegekunst (Bird Flight as the Basis for the Art of Aviation) measurements on wings, so called polar diagrams, which are the concept of description of artificial wings even today. The book gives a reference for the advantages of the arched wing. 9 October - The first brief flight of Cl�ment Ader's steam-powered fixed-wing aircraft Eole takes place in Satory, France. It flies uncontrolled approximately 50 m (164 ft) at a height of 20 cm, the first take-off of a powered airplane solely under its own power. Samuel Pierpont Langley flies the Aerodrome No. 0, 1 & 2 powered unmanned model aircraft. Otto Lilienthal flies about 25 m (82 ft) in his Derwitzer Glider. February - The first contract is awarded for the construction of a military airplane: Cl�ment Ader is contracted by the French War Ministry to build a two-seater aircraft to be used as a bomber, capable of lifting a 75-kilogram (165-pound) bombload. August - Cl�ment Ader flies 200 m (656 ft) uncontrolled in the Avion II (also referred to as the Zephyr or x�ole II) at a field in Satory. Otto Lilienthal flies over 82 meters (90 yards) in his Sx�dende-Glider. Otto Lilienthal flies about 250 m (820 ft) in his Maihx�he-Rhinow-Glider. Lawrence Hargrave demonstrates a human-carrying glider in Australia at an aeronautical congress in Sydney. 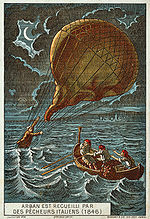 It is based on the box kite, an invention of Hargrave's. It becomes an example for several scientific kites and aeroplane constructions. First experiments of the Englishman Philipps with a 50-wing-plane. 31 July - Hiram Maxim launches an enormous biplane test rig (wingspan 32 m, 105 ft) propelled by two steam engines. It makes a short captive hop after running down a length of railway track. October - Samuel Pierpont Langley flies the unmanned Aerodrome No. 4 over the Potomac river a distance of 130 ft.
November - Lawrence Hargrave demonstrates stable flight with a tethered box kite. 4 December - German meteorologist Arthur Berson climbs up with a balloon to 9,155 m.
Czeslaw Tanski successfully flies powered models in Poland and begins work on full-size gliders. Railway engineer Octave Chanute publishes Progress in Flying Machines, describing the research completed so far into flight. Chanute's book. a summary of many articles published in the "American Engineer and Railroad Journal", is a comprehensive account on the stage of development worldwide on the way to the aeroplane. Otto Lilienthal's Normal soaring apparatus is the first serial production of a glider. With different aeroplane constructions he covers distances up to 250 m.
Percy Pilcher makes his first successful flight in a glider named Bat. By the mid-1890s, the Imperial Russian Navy has established "aerostatic parks" on the coasts of the Baltic Sea and Black Sea. 6 May - Samuel Pierpont Langley flies the unmanned Aerodrome No. 5 from a houseboat on the Potomac River a distance of 3,300 ft (1,006 m). June - Octave Chanute organises a flyer camp at Lake Michigan during which both a Lilienthal-glider (reconstruction) and a biplane built by Chanute are tested. 9 August - Otto Lilienthal crashes during a routine flight in the hills of Stx�lln and dies next day because of a spinal injury. November - Samuel Pierpont Langley flies the unmanned Aerodrome No. 6 a distance of 4,200 ft (1,280 m). David Schwarz's rigid airship makes its first flight at Tempelhof field, but crashes. Germans August Parseval and Hans Bartsch von Sigsfeld invent the kite balloon for observations in strong winds. 11 June - Salomon Andr�e, N. Strindberg and K. Fraenkel attempt an Arctic expedition to the North Pole by free balloon from Spitsbergen. Theywithin three days but manage to survive for several months in the pack ice. Their remains are discovered in 1930 on White Island. It was possible to develop the located film material. 12 June - Friedrich Hermann Wx�lfert and his mechanic are killed when their petrol-powered airship cataches fire at a demonstration at the Tempelhof field. 14 October - Cl�ment Ader later asserts that on this date he made a 300 m (984 ft) flight in his steam-powered uncontrolled Avion III also referred to as Aquilon or the x�ole III. His claim is disputed. The French Army is not impressed and withdraws funding. The first flight in a rigid airship is made by Ernst Jx�gels, flying an all-aluminium craft designed by David Schwarz and built by Carl Berg. It is damaged beyond repair while landing. Santos-Dumont flies his first balloon design, the Br�sil. The Langley Aerodrome is commissioned by the United States Army Signal Corps. The A�ro-Club de France is founded. April - Gustave Whitehead claimed to have flown his steam-powered aircraft a distance of 500 m (1,640 ft) in Pennsylvania with a passenger. The Wright brothers begin experimenting with wing-warping as a means of controlling an aircraft. Samuel Cody begins experiments with kites big enough to lift a person. Percy Pilcher flies various gliders and is close to completing a powered machine but is killed when his glider crashes at Stanford Hall, England after a tail strut fails. The flight had been intended as a display of powered flight, but when the engine was not ready in time, Pilcher used a team of horses to pull the glider into the air. 2 July - Count Ferdinand von Zeppelin pilots his experimental first Zeppelin, LZ1, over Lake Constance, reaching an altitude of 400 meters (1,312 feet) with five men on board. Although the flight lasts only 18 minutes, covers only 5.6 kilometers (3.5 miles), and ends in an emergency landing on the lake, it is the first flight of a truly successful rigid airship. 12 September - The Wright brothers arrive at Kitty Hawk, North Carolina, to begin their first season of glider experiments there. 3 October - Probably on this date, Wilbur Wright makes the Wright brothers' first glider flight at Kitty Hawk. During their tests, they will fly the 1900 glider both as a glider and as a kite under various wind conditions. 23 October - The Wright brothers abandon their 1900 glider in a sand hollow and break camp at Kitty Hawk to return home to Dayton, Ohio.